arcanum wings and spellskite question. 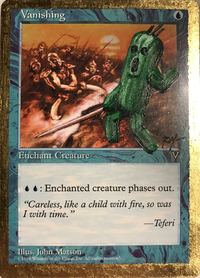 Madcookie, you wouldn't be able to activate caged Mirage Mirror twice in your second case because Mairsil's caged abilities may only be activated once per turn. 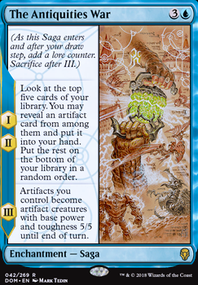 If an opponent casts Smelt on one of your artifacts and you want to save it, you would first activate the caged Spellskite ability to retarget to Mairsil (this is allowed, though as long as Mairsil is not an artifact, nothing will change when it resolves). 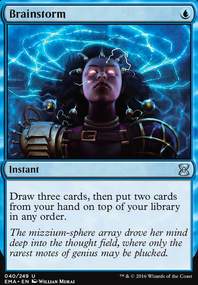 Then you activate Mirage Mirror targeting whatever artifact of yours is going to be destroyed, turning Mairsil into that artifact. Then the Spellskite ability will successfully retarget Smelt to Mairsil, and Mairsil will be destroyed. Madcookie's answer for the first case is correct. 1st case: Opponent cast Murder on another creature. You respond with caged Mirage Mirror targetting a land, then before that resolves activate caged Spellskite . The spellskite ability resolves first and you retarget the Murder to Mairsil and hes considered a legal target so Spellskite limitation from the rules shouldn't apply. Then the caged Mirage Mirror resolves and turns Mairsil into a land. Finally Murder tries to resolve and at this point it should fizzle. 2nd case: I think there won't be need to sacrifice Mairsil att all in this case either. I cast Abrade on your Sol Ring . You activate Mirage Mirror 's caged ability targetting a land, the spellskite, then Mirage Mirror again, targetting Sol Ring . Now Mairsil becomes an artifact, then redirects Abrade to himself, then becomes a land and at the end of all of this Abrade should fizzle. 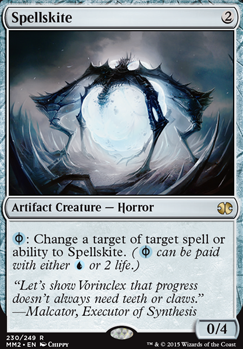 Rules sidenotes: (2011-06-01) The target of the spell or ability won’t change unless Spellskite fulfills all the targeting criteria, even if multiple instances of the word “target” are used. For example, you can’t change both targets of Arc Trail to Spellskite. I'm reading this as "fulfills targetting criteria" by the time of the resolution of spellskite's ability, not the re-targeted spell. I'm sure the other guys here will correct me if I'm wrong so I'd wait for their opinion too just to be on the safe side about this interaction. 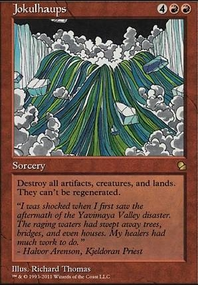 Additionally, if Mairsil, the Pretender is less important than another card (for example an artifact) and is not a legal target (for example for a "destroy target artifact" effect), could i activate Spellskite and respond with Mirage Mirror to sacrifice Mairsil, the Pretender instead of that artifact, making it a legal target on the stack after activating Spellskite ? 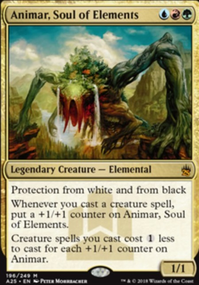 If someone targets for example a creature other than mairsil with a spell and I have Mairsil, the Pretender on the field with Spellskite and Mirage Mirror caged, can I activate Mirage Mirror and then Spellskite in response to that (for example targeting a land) to "counter" the spell? My idea is to change the target to Mairsil, the Pretender while it is a legal target and make it an illegal target on the stack after Spellskite 's redirect ability resolves. Ashen0ne on Smacking A Dragon-God Off His Own Citadel! Hey buddy! Like the deck so far. As I’ve never tried control in cedh I don’t have much in the way of suggestions but a couple things did come to mind. Misdirection , while not being a common choice among Cedh players does give you a secondary FoW like effect. And you can always bait people into playing into it in some way by appearing tapped out. That being said it is a little more situational than FoW so it might not work as well. Silence will ensure any other control players or anyone with spot removal can’t disrupt you on the turn you want to win. Or it can lock an opponent down on the turn they want to win. Otherwise I’d say it’s looking pretty good. Torpor Orb shuts down 3 of your 6 creatures but it’s too good not to run as a control piece. Might consider swapping some of them out with even more control like Glen Elendra Archmage or even Spellskite to save you’re aetherflux or citadel from spot removal. Testing some Knight of Autumn mainboard instead of sideboard, as they kind of fill the void that cutting Kolaghan's Command had left. The fact that I can tutor for it with Eldritch Evolution is great also. Leaving one Courser of Kruphix and moving the Graveblade Marauder to the sideboard. Marauder is an absolute house, but a lot of Game 1's there isn't a lot of removal, so I would rather bring him in alongside Alesha, Who Smiles at Death and extra Spellskite s for removal heavy matches. What's your opinion on Harm's Way ? It can possibly one-and-a-half-for-one the opponent by making them burn their own critters. Goblin Guide , Grim Lavamancer and Eidolon of the Great Revel all get btfo. Monastery Swiftspear is the only common creature that could survive it. Opal-Eye, Konda's Yojimbo has an effect that might be useful to the strategy: it can soak Lava Spike s and other player-only damage (unlike Spellskite ), and can't be countered by Skullcrack (unlike prevention and lifegain). And while on the subject of damage redirection, Empyrial Archangel would be nearly impossible for Burn to win through. 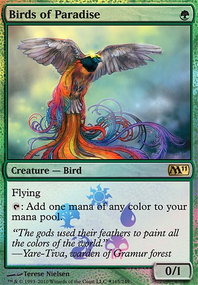 And it can be pulled out with Angel's Herald if you can run Bant colors. This is might be too slow for modern, and might require too much of a rework. One amusing possibility might be Hedron-Field Purists . With one counter on it, it turns all their Lightning Bolt into Shock . It also hates Grapeshot , Empty the Warrens and Walking Ballista , potentially making this more competitive against other decks. Tormod's Crypt and Smash to Smithereens to dodge your own chalice on one. Not a fan of Spellskite or Gemstone Caverns in this deck.